Exactly, EVERY car can be tamed or controlled to even a masters degree, ANY car, Just takes getting to know the car and what it and you are capable of achieving, You may be able to drift Astons and Jags with one finger, But if you have enuff practice and exp, You can do that in any car, If Cameron Diaz practiced and got to know the car, Even a Koenigsegg, Her exp and practice would pay off and soon she would be able to do what you said. Practice, leads to expierence, And exp leads you to be BETTER at whatever your doing, That's a fact in everything one does, doesn't matter what the subject is. Every car has both a wide and narrow range of error, But again, The biggest difference in discovering that is the Driver. Every cars limits are different, Or are they? Some may say they have reached the cars limits, yet others can get more out of it and go faster, So that's quite subjective. When I first got my SkyLine back in 02, That thing was rather brash, Now its got more then DOUBLE the power, More aggressive suspension, And its easier to drive now then when it was back then when I learned to drive it like I had telepathy. Now as far as handling goes, I don't really believe in bad or good handling, Because that's just as subjective as everything else, I think theres just differences and feelings rather then bad or good. yes, and isn't that the definition of how well a car "handles" ? I have no problem with cars being a handful, just don't take liberties with them with lives at risk. I think you're missing BR2+'s point completely. Again you say all cars are the same because at some point all cars are drivable and all cars can be dangerous on the limit. Yet Jags and Astons can be easily drifted and controlled even by Cameron Diaz with 1 hand. Fact is, cars like the 458, GT3, BMWs, are predictable and have a WIDE range for error. The CCX doesn't. Other cars like an Evo you can throw it into a corner way faster than you should and you'd still come out the other side unphased. Can't say the same for this car again. Any error can be corrected, But its up to the DRIVER to do that, Regardless of what car it is, We all know certain cars are more leary then others, But any car can be tamed, We all know Koenigseggs are monsters in every type of performance aspect, But its the driver that's the biggest factor in extracting what you can from a car, Regardless of which car it is. If it were me owning the Koenigsegg, I wouldnt want it any other way, I WANT a car to behave and handle like a monster, I want that tail happy axe murdering feeling, I want a no nonsense kill me if im getting to cocky in a car feeling, Thas why I Love Vettes and Vipers, THAT is what is so appealing about these cars, It makes you work...to stay alive. Unlike many of the cars today. It takes years to propery balace and set up cars, also stability maagment systems must to be top quality. That why cars made by compaies like Porsche or Ferrari are so complete. CCX is great car, but it take those thigs to level them up. So on paper Koenigsegg's looks awesom and very fast, in reality dangerous at the limit, lacking of track mid range torqe, not linear at getting to its maximum. Upredictable. Similar to the ZR1 being terribly unpredictable, these cars are outright dangerous on the limit, especially drifting. you may say this driver was an idiot, but we all know the Stig crashed the CCX a long while ago too on a harmless wide bend. These cars should be driven with the TC on all the time really. You should notice the FIRST word in the title video...Driver not car.. The Nordschleife comparison by pro Marc Basseng took place under well defined conditions: OEM cars of a collector, new OEM tires, 45 kg fuel, better of two timed laps. Unfortunately only one timed lap could be completed with the CCX before light rain started in some spots and Marc Basseng lost the car (a beast indeed). He estimated that he could improve on this 7:33.55, but that the quality of the suspension / set-up was far from the level needed to catch the Enzo etc. Ferraris are babies compared to this! Somebody should bring one of these to Breakaway Dragstrip near altha Florida on May 28. Theres a prostreet race so you can hold some awesome grudge matches. 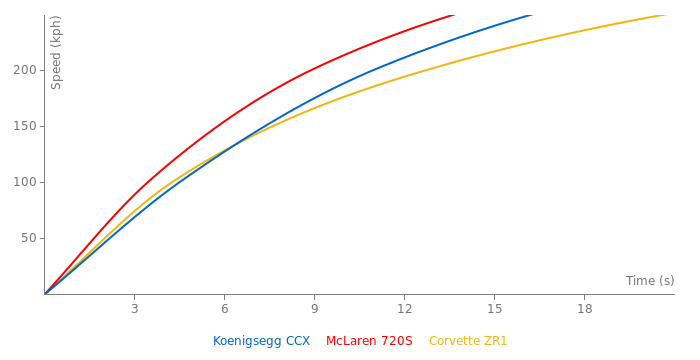 but the ccx's laptime(with spoiler) was very close to that done by the ccr(without spoiler). To chevy47, it would have been slower because you cant take corners as fast without the spoiler holding the back end down. obviously the spoiler doesn't do much, i mean the ccr has aproxamatly the same drag coeficciant as a regular ccx (without wing). the nurburgring laptime was done by the ccx with the wing, so would it have been faster without the wing? the nurburgring laptime wasn't bad. yep if you watch the video right be he enters the track you can clearly see the "top gear wing" on it. was the nordschelife laptime done with the rear wing? r u just realizing this? and who ever drove this car with those straight line statsup there, is a TOTAL JOKE. dont let him or her ever do a test with cars again. that guy in texas was clocked at 240.2mph, but that was the CC V8S, not the CCX, but Christian Von Koenigsegg says with a long enuff straight this car could reach between 255 to 259, but that top speed listed up there was made on the Nardo track with a headwind.